Tying the knot with Singaporean heiress Arissa Cheo (石貞善) in 2013, Vanness Wu‘s (吳建豪) relationship was laden with separation rumors throughout the five years of their marriage. After numerous fights and even living separately, the couple filed for divorce on June 20. 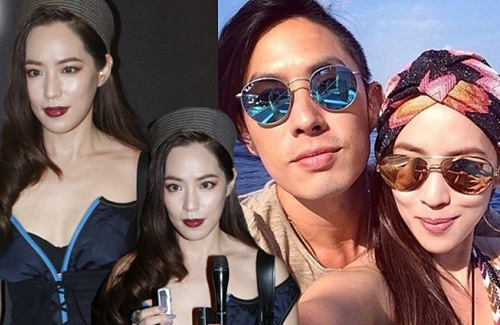 In the beginning of 2015, Arissa and Vanness briefly reconciled but not long after the two made up, Arissa was suspected of getting too cozy with one of her male friends, Harris Chan (陳柏熹). Harris also referred Arissa as his fiancée on his Instagram post. While the media pointed the fingers at Arissa as to why the marriage failed, the heirless released an official statement through her lawyer exposing the real reasons behind the nasty divorce. In her statement, Arissa stated that Vanness often got too friendly with females, failing to return home on some days, as well as never admitting fault in their arguments. Having registered for their marriage license in Singapore, where the divorce laws are stricter, they were supposed to live three years apart first before the divorce was final. However, it was rumored that Vanness and Arissa were already planning divorce for a lengthy time and were living separately for several years now. Although Arissa released the solo statement on her end, Vanness did not seem shaken. Currently filming in Shanghai, Vanness released two photos of himself happily holding two children in his arms. Do they share children together? These two sound like they shouldn’t even go out at the start, let alone marrying one another >_< I don’t know what they were thinking! No, they do not have any kids together, thank goodness or else it would be an even bigger disaster. I agree that they should not even date from the beginning. Even when dating, they would fight and break up over and over again. After they married, the same pattern repeats itself. They remind me of one of my cousins whose marriage was short lived as well. There were clearly many red flags before marriage but they went ahead and married anyways which was a big mistake. I guess they just wanted a big wedding celebration which is the easy part but the marriage life after that is what is difficult. Anyways,hope they will find someone more suitable and move on. @hetieshou it’s a little bit like JB & SG’s relationship. everyone wanted them to have a happily ever after. but now it shows, there’s always a reason for an on/off again relationship. they don’t last most of the time. @hetieshou Yeah, if s relationship is already not smooth before marriage it is unlikely to improve after marriage. Do not marry if we cannot accept each other strengths and weaknesses. Looks like they will still trying to change each other after marriage. they were together for 7 years on-again, off-again before marriage. they should know better than to get married. the 5 years they were married was really wasted…time is precious and don’t expect either party to change after marriage. it will be blessed if neither change for the worse. As you have said. Sometimes people (myself included) DO see red flags. But in the ‘romantic’ and idealism of Youth, some may think trying harder or being more accomodating is ‘romantic’. Or that people will change over time. Lucky for them they have no kids. He must have shown signs of London = > Paris roving eyes even during their relationship (and her crowd of pretty friends), but she may chosen to ignore it. Or fought over it, and forgiven again. Anyone without a strong centre for values or respect for partner, will err and err again. This heiress sounds like she did make sacrifices – she moved to Taiwan, when cushy home is in Singapore. @nomad822 I agree with you that it does seems she made the sacrifice. Funny enough, at the beginning, I thought she’s just a spoiled rich child who doesn’t know the meaning of sacrifice, at least this article improved my POV on her a bit! I swear sometimes men just need to man up and admit they were wrong!! !